The challenge is always the same: solve a real-world problem using robotics, mechanical engineering, programming, and teamwork. The playing field is a tablecloth-sized map. It gets covered with objects that must be touched or avoided. The players are robots built and programmed by your children. When the action takes place, the robot must complete activities based on how it was built and programmed. No human interaction is allowed. There is a time limit. Scoring is based on how well a robot performs the defined tasks. 1) The real-world challenge theme is presented. In the past we've seen transportation, the environment, space travel, and more. 2) The map is provided. The exact challenge details are still secret. 3) Teams speculate on the challenge based on the map and the theme. They brainstorm. They experiment. 4) The challenge details are revealed and all competitors have an equal amount of time to engineer and program their robots. 5) Teams compete locally for practice and regionally to qualify for a Championship Event and then the World Festival. Local competitions and qualifying tournaments are separate events. We do the work to find solutions with guidance from our coaches and mentors. We honor the spirit of friendly competition. What we discover is more important than what we win. We share our experiences with others. We display Gracious Professionalism in everything we do. Great Minds Robotics promotes tournament competition. 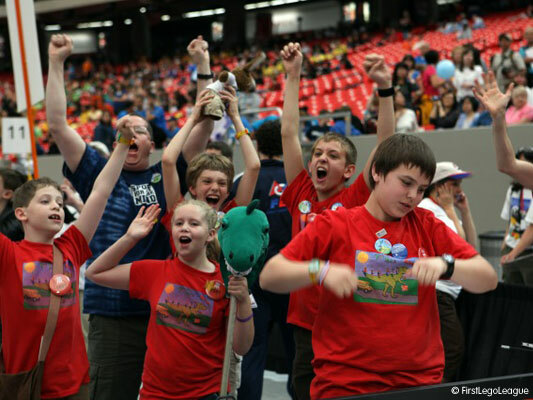 We prepare teams to compete in the world-wide First LEGO® League Robot Challenge as well as local and class vs. class events. Enroll your daughter or son today to give them an opportunity to compete. We will not guarantee anyone a spot on a team. That privilege is earned through dedication of time, attitude, and effort.